Google Maps' version of the border between Nicaragua and Costa Rica has become part of a dispute. The comments came in a report from the Costa Rican newspaper, La Nacion. Tech blog SearchEngineLand picked up on the news and questioned the accuracy of the Google Maps border. A side-by-side comparison of Google Maps and a map from Bing, Microsoft's search engine, show differing borders in the area of the Caribbean coast, near the San Juan River, according to that technology blog. Google is looking into the issue and will correct the map if an error is found, said Kate Hurowitz, a Google spokeswoman. She said Google gets its mapping data from a number of sources and that it is notoriously difficult to keep a global map completely up-to-date. "It's inevitable that there will be occasional errors in that data, but when we find these errors, we work to update them as quickly as possible," she said. Nicaragua has asked Google to keep the border line at its current location, according to the Wall Street Journal's blog Tech Europe. 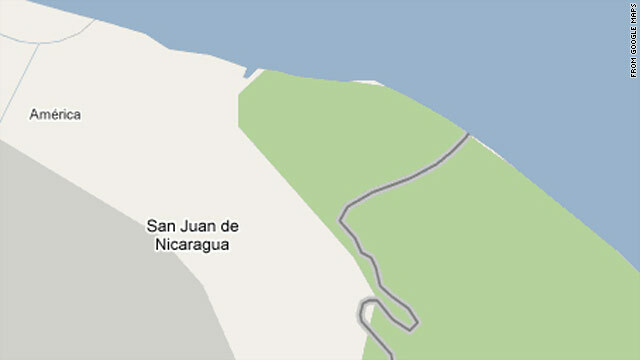 In a statement to that blog, the Nicaraguan Embassy in London said: "The Government of Nicaragua has formally requested to Google not to accept the petition of Costa Rica to modify the border demarcation presented on Google Maps service, which recognizes [the disputed area of] Harbour Head as Nicaraguan territory. The path presented by Google corresponds to the various treaties that define the Nicaragua-Costa Rica border." Costa Rica has asked for the border to be changed on Google, according to the report in La Nacion. "There's a mistake in Google, we have sent a note to the company so that they can correct the map," Costa Rica's deputy foreign minister, Carlos Roverssi, told the Costa Rican paper. Google Maps are not meant to be official or used in international disputes, but Google's digital borders have been the source of controversy before. Earlier this year, Cambodia blasted the Mountain View, California, tech company for its "radically misleading" map of the border between Cambodia and Thailand, according to Reuters. A city in Florida also complained it had disappeared from the site. Google Maps and Google Earth mark officially disputed borders with red lines or dotted lines. The line between Costa Rica and Nicaragua was not marked as one in official dispute, Hurowitz said, but that could change if a disagreement over the location of the border develops between the two nations. Google recently updated several international borders by using higher-resolution maps, Hurowitz said. Even seemingly obvious border lines -- such as those created by rivers -- can be complicated depending on the clarity of the satellite images used to create the maps, she said. "Rivers are not often straight lines -- they twist and turn so the border twists and turns," she said. "But if you don't have high enough resolution border data, you're not going to catch all those twists and turns." Furthermore, different versions of Google Maps show different borders. Google Maps China and Google Maps India show different versions of the border between those two countries because national laws require Google's maps to look a certain way when viewed from each location, Hurowitz said. The U.S. version of Google Maps shows both boundaries between China and India since the border is in dispute, she said. Costa Rica's president is urging calm amid the border dispute with Nicaragua. The country claims its neighbor planted a flag on Costa Rican soil, according to a report from the CNN Wire. "Dear Costa Ricans: never before have we had to be united when the aggression and provocation test us," President Laura Chinchilla said in a televised address. "Let us be calm and firm, amid the outrage that these events provoke within us."